Congress will be in power in Telangana in 2019. 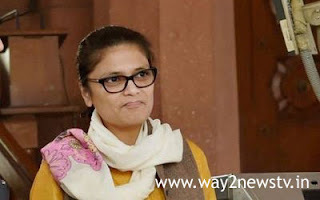 National woman Congress president Sushmita Deo said Rahul Gandhi was the prime minister. She attended the Congress Women's Garjana Sabha on Monday. Sushmita said that the Congress government has strengthened self-help groups. Do you remember the KCR that you are aware of the number of women in the Self Help Group? Such women will be held in every district. KCR has given each job a job before the election. The house is not a woman's move but it is not yet given to the woman. KCR's daughter is talking about this poem, she said. She alleged that Kavithamma gave Rs 30 lakh saris to the woman of Telangana costing saris, costing Rs. MLA Dekay Aruna said that KCR who came to power with sentiments was corrupting the state. Sonia is credited with giving Telangana the future of the state. Telangana gave the TRS to the party and cheated by saying that he will do the Chief Minister of the KCR. Son, the daughter, gave jobs to the son-in-law Telangana forgot the children .. In all cases, people have done injustice. Women's unions have not been discriminated for .. No loans for any community .. Women in Telangana state are in financial trouble. It will be unfair without interest-free loans. The Congress party comes to power in 2019. Sarka said that the women's societies will be behind.